The Government devolving powers to the Lincolnshire or Greater Lincolnshire area could provide an ‘exciting opportunity’ to change the area’s ‘destiny’, according to the leader of Lincolnshire County Council. Coun Martin Hill revealed there had been ‘good discussions with councils and other partners in Greater Lincolnshire’ about making a bid for devolution later this year. He also confirmed that an idea for a unitary authority to cover the county was ‘off the table’. This idea, which could have seen the joining of borough and district councils, was brought to the fore as a suggestion to help the council save £30 million a year. He said there had not been complete agreement over unitary authorities and so the idea had been scrapped in favour of devolving powers. He said the government had ‘made it clear’ that it would not impose or get involved in arguments. Speaking to The Standard about devolution, he said: “Now that the Unitary debate is off the table, we [local authorities and other organisations] are looking how else we can work together. Devolved powers are set to give local authorities more say over how they run and fund themselves, with the idea that local people will know what they need best - going right down to parish councils. He said: “The first and foremost thing is decisions could be made in Lincolnshire, for Lincolnshire instead of civil servants sat in Westminster. 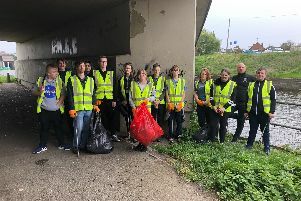 He said the council had held further conversations and were working with organisations - like Lincolnshire Police, the Clinical Commissioning Groups and the Environment Agency - to work on a bid for submission in time for the autumn sitting of Parliament. Coun Hill felt it could also save money for those organisations involved. Asked what he would like to devolve specifically, he said: “My personal view would be to look at developing skills. He also pointed to policing, infrastructure and looking again at transport in the east. “We are going to work something up and see. Parliament will rise shortly and we need to be ready for when they come back,” he said. The Secretary of State will then look at the bid and decide if it is acceptable. Manchester and parts of Cornwall have already submitted bids to Government.